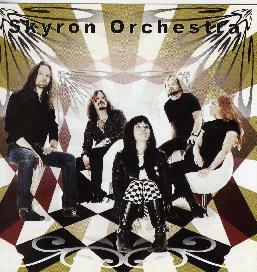 Skyron Orchestra - "Skyron Orchestra"
The Skyron Orchestra was born out of the ashes of Skyron. I am not sure why they added the Orchestra. Anyway, this is some damn cool organ driven 60's inspired music. It features some pretty cool mostly spoken word style vocals by Veronica and awesome organ by Anna. They are joined by Tomas on guitar, who used to play with the great Swedish band, Lotus. The rhythm section is made up of Jonas on bass and Stefan on drums. "Free Ride" opens the CD and is a great short catchy pop tune in a strange way. Cool track. "Call It Love" has a very cool throbbing bass line over which the guitar and vocals are sort of layered in and the organ as well. "Earthy Ground" and "Nobody's Diary" are both very moody pieces. "Soft Palate" reminds me a bit of some of the early Bevis Frond material. "The Doll" and "Pax Aeterna" are my favourite tracks on the CD as they are a bit heavier and have cool electric guitar lines that weave in and out of the organ sound and sometimes some effects on the vocals. The vocal really reminds me a lot of the way the vocals are sung and mixed on some of the Growing Seeds tracks on their amazing CD. The CD ends with the track, "Alena". Overall, a very successful and enjoyable CD. I would have liked some more lead guitar as it is used quite sparingly but perhaps they really jam in the live setting. Fans of the Bevis Frond's more 60's oriented stuff will really dig this band. For more information you can visit the Skyron Orchestra web site at: http://www.skyron.nu. For Transsubstans Records, visit the Record Heaven web site at: http://www.recordheaven.net.